I snagged this photo copy of a b&w print from the Historical Society ten years ago. It's been on my office bulletin board and above my desk for the last nine years. I believe the picture is from 1956. In addition to the row houses, two professional baseball stadiums were located here. 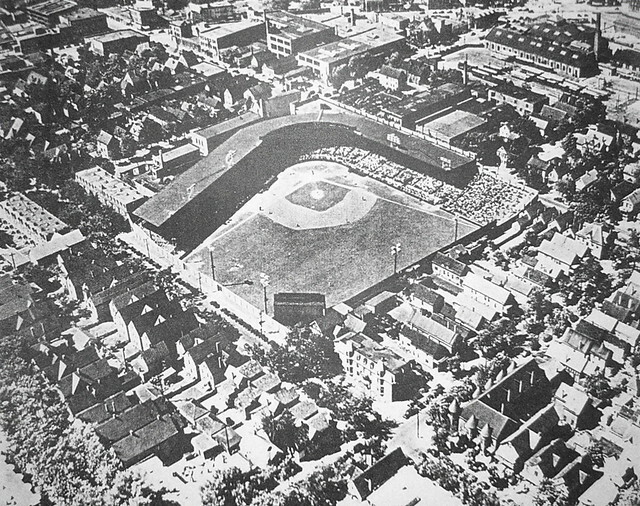 In the Fall of 1888 Olympic Park was moved by horse and wagon from the corner of Richmond Avenue and Summer Street and became the home of the Buffalo Bisons until Offermann Stadium was constructed on the site in 1924. Offermann Stadium's grand stands were designed by noted Buffalo architect Louise Bethune. The last game was played on September 17, 1960. Offermann Stadium was demolished later that year and Woodlawn Jr. High School opened on the same site in 1962. Today (summer 2006) the site is being renovated again, this time as the future home of Performing Arts High School. update...8/22/06 See aslo David Steele's BRO piece - A NIMBY's Worst Nightmare - reflections on Offermann Stadium and the high density mixed use development here in this little corner of Masten. Great comments. how bout having a home run sail into your back yard. now that is cool. Do you think they could get this past the nimby's these days? There's all sorts of stories about home-run balls in the neighborhood. Luke Easter - Bison's first baseman and legendary homerun hitter - is the only player to have hit one over the score board. Olympic Park - having been transported from the Summer/Richmond neighborhood in the fall of 1888 - predates the late 1890's residential building boom in this part of Masten. And all sorts of additional stories about neighborhood residents setting up and selling seats on the second floor porches along right field. Have any pix from back in the day? aloha fix buffalo, sad to say all i have are memories of the hood. webers grocery, lawson's next door to weber's, youngs gocery. attended st nicholas all the way through the 8 grade then on to cardinal dougherty, residing in wash dc for past 40 years. yes, i believe it would be the nw corner, sometime in the early sixties it was taken over by daniel gambino, i went to high school with his son danny jr, he got me a part time job there, $1.00 an hour, i would make $30.00 a week, a lot of money for a 17 18 year old back then, by that time i was living at 261 east utica, next door to halyards funeral home. I was just reading about Offermann Stadium and the other article about Frank Offermann. In his article he speaks of his father's siblings and I was wondering who they may have been? I am an Offermann. I believe the aerial photo of Offermann Stadium may be older than 1956. I attended games beginning in 1955 or 56 and remember the flood light towers were larger than those in the photo. I have 2 photos I took around that time of a Bison vs Miami Marlins game showing the larger towers. Also, you can see a church behind homeplate which I believe still exists on the SE corner of East Ferry and Michigan. The east wall of the church is angled to accomodate the stadium. There is photo that is just about identical this one in "Lost Ballparks; A Celebration of Baseball's Legendary Fields" by Lawrence S. Ritter. The photo is captioned as Bison (Offermann) Stadium in 1933. In his book, Ritter includes an entire chapter about Offermann Stadium which includes many photos and interesting facts. Luke Easter was apparently the only player ever to hit a home run that cleared the centerfield scoreboard. In 1959, the year the Bisons won the Minor League AAA World Series, my dad got us season tickets. We had a great time, watching future major leaguers like Ruben Amaro, Chris Short and Frank Herrara. One of my favorite memories of Offermann Stadium were the sights and smells of all the push cart vendors outside the park, selling sausages, hot dogs and fresh roasted peanuts. Lived in a row house adjacent to the stadium in the 40's and 50's. could see the games from our attic window. I sold peanuts on the corner as a kid. Anon - july 23 - please email me. Thanks. Another One in Artspace Impact Area!